Little did I realize that a visitor to my home on a summer day in 1975 would begin for me a collecting journey that has continued to this day. Canadian collector Harold Braker had contacted me looking for a variety of parts to complete several machines that he was restoring. He proposed a trade of "Columbia Twentieth Century" six-inch cylinders for my parts. I agreed and those cylinders became the starting point on my quest to complete the entire "Twentieth Century" set of some 189 cylinder titles. This article is being written as I close in on the completion of this dream. First a bit of history, with the caveat that I certainly do not proclaim to be an expert or to know everything regarding these long-format cylinder records. That said, I would much appreciate any comments, corrections or suggestions that would add to this article. In July of 1905, to expand their cylinder market, the Columbia Phonograph Co., Gen’l., introduced a new cylinder phonograph along with a new-concept cylinder. The new cylinder machine and accompanying cylinders were marketed under the name "Twentieth Century". The marketing gimmick was adding an extra minute of playing time by extending the length of the cylinder from the traditional four-inch length to a six-inch length. 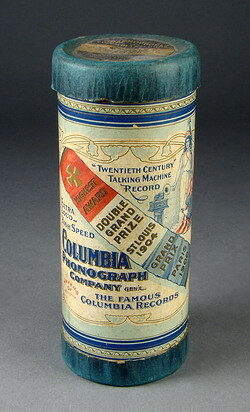 The colourful cylinder box contained the usual "Miss Columbia" image holding the American flag, but contained the additional wording "Twentieth Century Talking Machine Record" and, of course, was longer that its four-minute sister box. The first machines and cylinders were given the designation of "BC" and the machine alone had a hefty sale price of $100, with the horn being an extra cost! Several varieties of boxes exist. Besides the traditional box discussed above, there were boxes issued without the colourful label but instead with a simple small identification band around the centre of the cylinder box. This band simply indicated "COLUMBIA RECORD" and the small notation "U.S. Letters Patent July 5, 1898; June 13, 1899; September 17, 1901; March 10, 1903; November 25, 1902". I have been unable to confirm when this type of box arrived on the scene, but my guess at this point is that box-printing orders, after the project began a decline in sales, fell under the accountant’s sharp pencil to cut costs. This simpler format would have been a cheaper box to produce. Additionally, there was a "Twentieth Century Classic" box which can be identified by a red ribbon-style flag running from the top to the bottom of the box. These "Classic" cylinders are discussed below. There were at least three types of lids used on the "BC" cylinders: the lid which allowed for the record numbers to be hand-written on the available block space; the lid with the block space machine-stamped with the record number; and finally, the more traditional lid with the song number, title and artist machine-printed, similar to the Columbia XP series. Of note, there were promotional printed hand-outs for some cylinders, at least at the beginning of the "BC"” program. These hand-outs were four pages with a drawn character on the front cover, to outline something about the cylinder, such as a clown on 85001 Peter Piper. Pages two and three held the lyrics, with page four dedicated to listing locations of the Columbia Company’s agents world-wide. As we know, this is a format which Edison used and included within selections of certain Edison cylinder boxes. I believe that the Columbia approach was more of an advertising/promotional ploy not included within the cylinder box itself but, perhaps, a point-of-sale hand-out. I have only one of these printings, but have been told by other collectors that they have seen more of these promotional items. I would be interested if any ephemera collectors have encountered any of this format in the past. Of course, I would be interested in the acquisition of such paper advertising or a photo-copy of same, if any collector either has seen or may see such items in the future. The "BC" cylinders were released in small groups almost each month from July of 1905 to July of 1908, using the numbering series starting with 85000 and going through 85189. However, not all of the intervening numbers were used. Catalogs issued during the period 1905 to 1908 indicate that no cylinders were produced with the numbers 85054-56, 85155, 85163, 85171-72, 85179-80 and 85186. Cylinders were also issued in numbers from 72500 to 72510; however, I have not been able to determine if 72505 or 72507-09 were actually used, since I have not been able to locate titles for these cylinders. Over time, I have discovered that the catalog numbering may not be complete. My collection contains one cylinder not listed in the catalog (85155) and I have reason to believe that some entries were made to the catalog that appear to be "manufactured on request" cylinders and, alas, I fear that some may never have been requested and sold to customers. Most of the cylinders originally sold for 50 cents each, except for a small group called "Twentieth Century Classics", which sold for 75 cents each. The "Classics" are those in the 72000 number sequences. Prices were reduced if cylinders were purchased in lots of 12 or more. Over the period 1905 to 1907, several more models of cylinder machines were introduced which played the longer "BC" cylinders. These machines were priced from $45 to $70. Incidentally, all of the long-mandrel series machines had the capability of playing the shorter standard four-inch cylinders. From my discussions with other collectors and from what has been documented in history, it appears that the "Twentieth Century" program was not the winner that Columbia had hoped it would be. Sales seriously lagged behind projections and, although Columbia continued to release new cylinder titles, the inventory of unsold cylinders mounted. I have not been able to determine with any accuracy just how many cylinders of each selection were actually produced but, by the summer of 1908, it appears that Columbia "pulled the plug" on the series. The Company continued to market the cylinders by special order but, for all intents and purposes, the program was finished. Contributing to the further demise of the "BC" program was the introduction, by Columbia and Edison and other companies, of the four-minute cylinder in a four-inch long format. With hindsight, the "BC" program was a marketing mistake. Many of the cylinders remained in inventory for several years and, as orders slowed, these were later destroyed. Through time, other problems have manifested themselves. The chemical composition of the cylinder made it very susceptible to mold and mildew problems. Like most wax cylinders, the passage of time has made these cylinders very brittle and many have developed chips, pin holes and hung grooves resulting from the use of a wrong reproducer. Of interest, I have noticed that the extra length created some problems for the customer in the mounting of the cylinder onto the mandrel of the cylinder machine. This is manifested in a number of cylinders having small chips on the "start" end. We all know about care and mounting a standard-size cylinder to play, so I can imagine that dealing with the extra length must have been "interesting" at best! These "BC" cylinders are still found today, but are difficult to find in playable condition. Recent offerings on e-Bay have turned up in very poor condition, with the very honest comment by the seller, "purchase only for display". Most interesting is the concept that the traditional wax cylinder with surface shine translates to good sound. Caution abounds here. I obtained what appeared to be an almost perfect Uncle Josh format cylinder and, while having an almost mint look, it actually yielded a sound that was barely audible. So I would caution you that, if considering the acquisition of one of these cylinders, do try to confirm the sound quality in advance or insist upon the right to return the cylinder if it’s noisy or not playable. Additionally, as these cylinders do require the special long mandrel to play them, I have visited collectors who have "BC" cylinders and have never dared to play them, due to lack of a proper machine. I have maintained a (sort of) record of the re-sales of these cylinders by number, condition and title stretching over the last 20 years or so and it is no surprise that the quality of the offerings is declining as the residual supply of this genre slowly disappears. Of note, the "BC" format is now being reproduced in England and I have been informed that, although made of wax, the result is excellent. I salute this effort and think it a significant step to allow all collectors to have at least one of these historical treasures. The attempted completion of this set has been a fun experience. 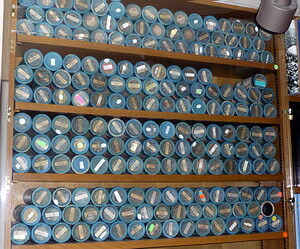 I have found these cylinders literally all over the world and my search has allowed me to become friends with many collectors whose patience and assistance over the past 35 years has been much appreciated. At the date of this printing, I have 13 cylinders left to complete the set - at least the cylinders indicated within the old catalog listings. As mentioned earlier, I believe that as many as 4 – 9 of these "BC" cylinders may not have ever been manufactured. That said, I do have lids for several that I still need, so I at least know that these were actually manufactured and issued. I would appreciate hearing from any collector who has "BC" cylinders. I have posted an earlier article on this subject at the "World of Phonographs" web-site. To view, simply visit the Internet Google or other search engine address and type in "Larry Hawes Columbia Cylinders", and that should bring up the article. Essentially, that piece is very similar to this rendering, but does include many photos of the cylinders discussed here. I would be happy to provide my want-list on inquiry. To complete my set, I offer two E-quality "BC" cylinders for any one that I still need, or I would offer to purchase outright. Even if you do not wish to sell, I would appreciate hearing from any of you to provide me with record numbers in your collection so that I might be able to determine which "BC" cylinders were actually manufactured and sold. Finally, I encourage you to contact me for additional information and corrections, additions or suggestions. I can be reached by email at: << hawescpa@aol.com >> or phone at 425-823-5818 in Seattle. Will I finish this odyssey before the end of this "ride"? Who knows? Until that event, I will to be, as we all are, a custodian for those that follow us.